Inspired by an appetizer I had at a local pub, this is a quick dish that has great flavors and is fun to eat. 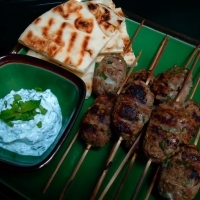 The kofta kabobs may be broiled or grilled. Preheat whichever you would like to use. I broiled at 450F. Soak wooden skewers in water if using, or use metal. Meanwhile, grill or broil pita bread about 2 minutes on each side until beginning to crisp. Combine yogurt with parsley & mint. Mix well. Serve all together. This is lovely Dahlia! Jim loves Koftas. Bookmarked to give a whirl. Thx.